Does Your Dog Have Cherry Eye? If Fido has a red, swollen lump at the inner corner of his eye, then the most likely diagnosis is a condition called 'Cherry Eye'. This is caused by prolapse of a tear gland attached to the third eyelid (yes, dogs have these, in fact most animals do). The gland slips out of place, and bulges forward, causing the distinctive red 'blob' that you can see in the photo on the left. Although this isn't a serious (or generally even a vision-threatening) condition, it can't possibly be comfortable to have your vision blocked in this way. This condition is something that usually happens as a result of a congenital weakness... ie. it's an inherited trait. Also, some breeds are more prone to carry the gene for cherry eye than others. But, just because a dog is from an 'at risk' breed, that doesn't necessarily mean he'll ever have a problem. Irritation, infection, over-exertion... all sorts of things might trigger the prolapse. Or it could appear one day for no apparent reason. Because of it's genetic component though, dogs who have developed cherry eye shouldn't be bred and pass on that weakness. 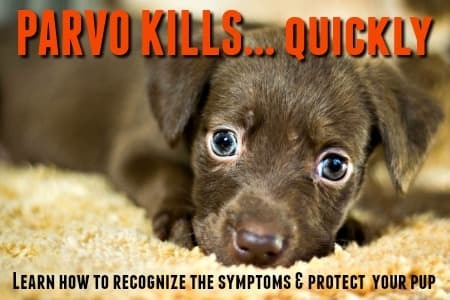 This condition usually appears in younger dogs (under two years old). This is my dog Ivan. 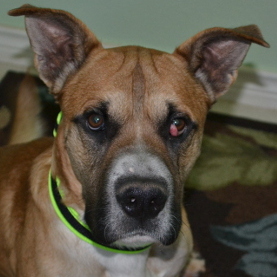 Read about his experience with cherry eye here. Also, if one eye is affected, there's a higher-than-average chance that the second one will also have a problem sooner or later. The longer the gland is allowed to remain prolapsed (ie bulging), the lower the chances of it being returned to it's proper place - and staying there. So, if Fido suddenly displays a swollen, red blob in the corner of his eye, you need to take action as quickly as you can. That way you have a better chance of a quick and simple procedure fixing the problem. There are two surgical options for treating this condition, and there are non-surgical approaches that sometimes help, especially if you catch the problem early enough... before the gland has 'dried out'. Some people have had good results from 'massaging' their dogs eye which helps the gland to 'pop back' into place. You would need to be very careful with this though, because too much pressure, or pressure in the wrong place, could do more harm than good. In the same situation you might also want to try eye-drops to reduce the inflammation and swelling, which may allow the gland to slide back into place of it's own accord. This is by no means a guaranteed 'cure' but in some cases it can work. Your veterinarian can prescribe anti-inflammatory drops or ointment, and I'd really recommend making your veterinarian's office your first stop when dealing with this issue. The most common treatment for a dog with cherry eye is surgery, and there are two types. Both are done under general anesthetic. The first surgical option is when the gland is put manipulated back to where it should be and tacked in place. Although the surgery is minor, and can be effective, research shows that in up to 20% of cases, the gland eventually pops back out again, and the surgery needs to be repeated. Obviously there's a limit to how many times you are able to repeat the surgery. This tacking method used to be preferred by many veterinarians, especially when the prolapse is recent, and not too large, but recently more vets are now using a second option called the 'pocket technique'. 'There is a surgical technique called the pocket technique for cherry eye which, in my experience, is what most vets now use as opposed to tacking. It involves creating a small pocket into the third eyelid cartilage and ‘burying’ the gland into the pocket. The prolapse happened some time ago and has never been treated (or responded to non-surgical treatments). The less-invasive treatment of tacking the gland back into place has failed. This surgery effectively removes the problem of the prolapsed gland and third eyelid, but losing those creates new problems for Fido. Because the gland produces approx. 35% of the lubricating fluid in your dog's eye, a condition called 'dry eye' may develop over time, and is a long-term risk associated with this particular surgery. You can use lubricating eye-drops on a daily basis (vet prescribed, or recommended) to keep the eye moist and prevent this condition from developing. But if your dog does get dry-eye and it's left untreated it can cause irritation, discomfort, then pain and even potentially loss of sight. CLICK HERE to learn more about the cost of surgery for cherry eye in dogs (and read all about my dog's personal 'Cherry Eye' story too). 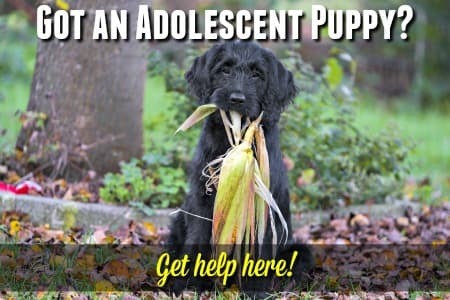 Your veterinarian is the best person to evaluate your dog's unique situation and advise you as to which course of treatment is best for him. 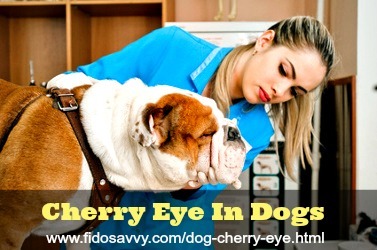 Getting an appointment to have Fido's cherry eye evaluated by a professional is the first step towards keeping his eye healthy and retaining his sight. Home › Dog Health Information Center › Does Your Dog Have Cherry Eye?